That is so cool about the octopus! My oldest (by 5 mins, lol), Brady, has been asking if we can get an octopus for his aquarium (he's serious). He would die to see one in the wild! LOVE that sentiment - you've really captured the feeling of the inspiration! Fabulous my friend. Love how you stamped every last detail of this card. You go girl :)! What a sentiment! I love it.... So freakin cool!! Fun colors! I think the gems add a lot. very nice job I love gems too! Brilliant card! Love the dress forms and the sentiment is wonderful! What an amazing card, especially for one layer, so much depth! Good luck with your quest! Fabulous! Love the colours, the bling, and that awesome sentiment - I laughed out loud. Great card, Jen. 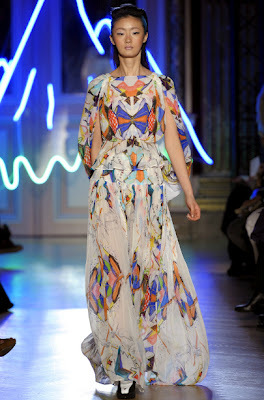 This is a fabulous take on the runway sketch, but that sentiment is just AWEsome!!! LoVe it Jen! That sentiment is brilliant and possibly a good reason to splurge on that set! Love this card! Great bold colours on the white! Jen, this card is Awesome! I LOVE the quirky dress forms and the fun sentiment! Very cool! That is SO fabulous! I love the colors and awesome CAS design. Those dress forms are gorgeous, and isn't that sentiment fun? Love it! 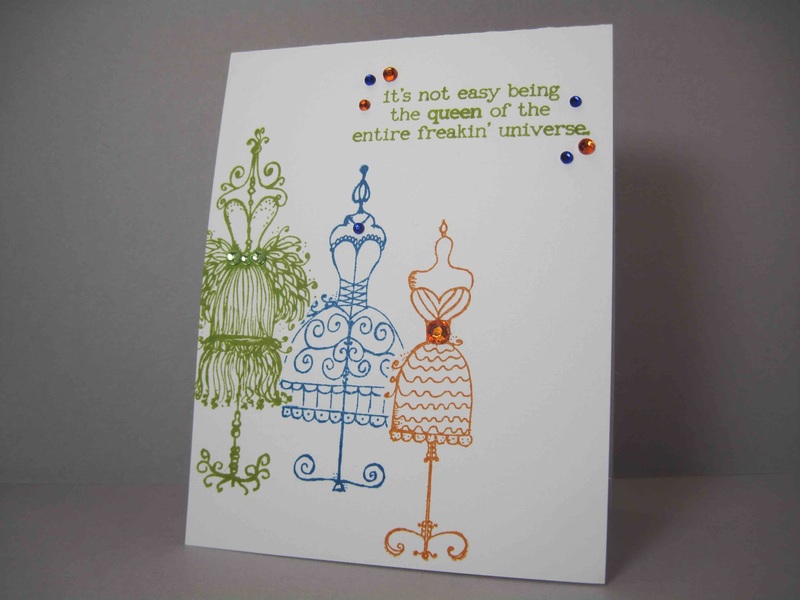 Great card, love the masking of the dressforms and that is one of the best Unity sentiments ever! Jen, this is fantastic! I love that sentiment, and I love how you've placed and coloured the dresses (and the bling)! THAT SENTIMENT IS SO ME! I love it. And since I'm trying to replace my usual go-to F word with 'freaking' it really is too perfect, lol. Love the colours, and so excited to hear the octopus is back! I want to see him too - and tell Luis if he eats him now, the interwebs will get him. Love what you did with the dress forms. The colors are awesome. I read your bio, & you sound a lot like me -- emerging from the craft cave only when necessary! I've never seen an octopus, except in captivity, so consider it a blessing. Jen this looks amazing!! Loving my dress form images!!! Haha I just love that sentiment!! 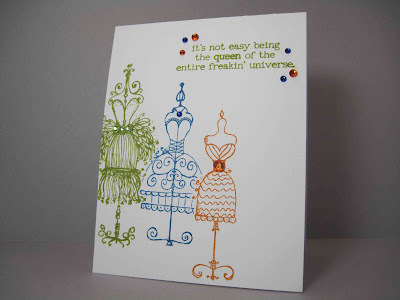 Fabulous one layer card!! Are you seriously kidding - this card is a total scream! Great images and that hilarious sentiment! Love the colors.....you never disappoint, Jen, but this is my current #1 fav! Beautiful card and what a cool sentiment! Thanks so much for playing along with us at the Runway Inspired Challenge, Jen! Fun card! Thanks for joining us on the Runway! That sentiment is so much FUN and the dress forms are some of the coolest I've seen!!! You have really showcased them by keeping it simple! LOVE it!! !